Why people in the West are more prone to allergies? HUMAN gut is host to numerous species of bacteria that enhance metabolism, protect against pathogens and prime our immune system to fight diseases. Dietary habits determine the diversity of this bacterial flora. Understanding this interplay is important as it controls the abilities of our gastrointestinal tracts. With increased use of antibiotics, vaccines and improved sanitation, Western countries have controlled infectious diseases but people there have simultaneously become susceptible to various allergies, autoimmune disorders and inflammatory bowel diseases in the past half century. Does diet have a role to play in the changing disease pattern? Paediatricians from Meyer Children Hospital in University of Florence examined 15 children each from Florence in Italy and a village in Burkina Faso; they were aged between one and six years. The doctors used DNA sequencing and biochemical analysis to compare their faecal microbiota and found African children had a lower proportion of gut microbes associated with obesity compared to children from Florence. Their stomach also had a greater abundance of fatty acids known to protect against allergies and inflammation. These fatty acids are produced in the gut by certain bacteria that were predominantly present in African children and missing in the Italian children. The paediatricians compared their finding with the eating habits of the children. The eating habit of Burkinia Faso children was similar to humans in Neolithic times, when agriculture had just started. Their diet is abundant in starch, fibre and plant polysachharides and low in fat and animal protein. The produce is local and consists of legumes, vegetables and cereals like millets and sorghum, ground to make flour and then used to make porridge called ‘to’. This diet is complete antithesis of a typical Western diet that comprises of animal protein, sugar, starch and fat and is low in fibre. “Reduction in microbial richness is possibly one of the undesirable effects of globalization and of eating generic, nutrient-rich, uncontaminated foods,” said Carlotta De Fillippo, molecular biologist associated with the study. No variation in gut microbial flora was observed in children being breast-fed because the diet remained same irrespective of their geographical location. This indicates diet may dominate over other factors such as ethnicity, sanitation, geography and climate in controlling the bacterial flora of the stomach, the researchers noted in the online edition of PNAS on August 2. The study is relevant in the Indian context. Indian food is rich in fibre and nutrients, but with increasing urbanization and adoption of Western food and lifestyle, fibre content has gone really low, said Rekha Sharma, chief dietician at Medanta Hospital in Gurgaon. The carbohydrate content has reduced to 60-65 per cent in the urban Indian diet from 70-80 per cent; the percentage of fat has increased. 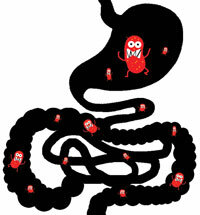 There is also an increasing dependence on pills for vitamins, which affects microbes present in the guts, said Sharma.